During the toad toad mating season, female toads lay thousands of eggs in wetlands. After hatching, the young tadpoles swim around, eating, growing and developing. After four to six weeks, the tadpoles metamorphose and leave the ponds. 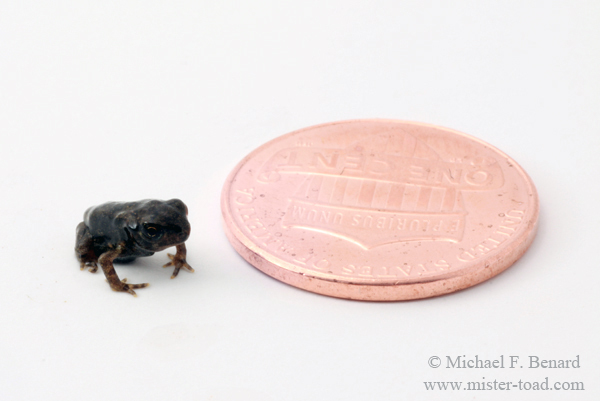 Toad tadpoles are often tiny, as illustrated by the photo shown above. Enormous numbers of tiny metamorphosed toads will swarm out of the ponds, seeking insects to eat and safe places to take refuge. Many of the young toads will be eaten by predators like garter snakes or killed by adverse weather conditions like drought. But a few of these youngsters will survive to become adult toads.